Those of us practically raised by Destiny's Child have been anxiously waiting for a true reunion to happen. I'm sure none of us thought it would be a gospel song that did it. The three women who consider themselves sisters have collaborated on a couple of tracks, but not a single. We interviewed Michelle recently, and she confirmed that they all still hang out a lot, and the love shared between them is real. Fans have been witnessing their careers take off individually as Michelle Williams, Kelly Rowland, and Beyonce.. but we haven't seen them unite in a big way as a group in years. That was until Michelle released her single 'Say Yes' from her latest album, Journey to Freedom. Following the song's release, she dropped the video that featured her DC3 sisters. 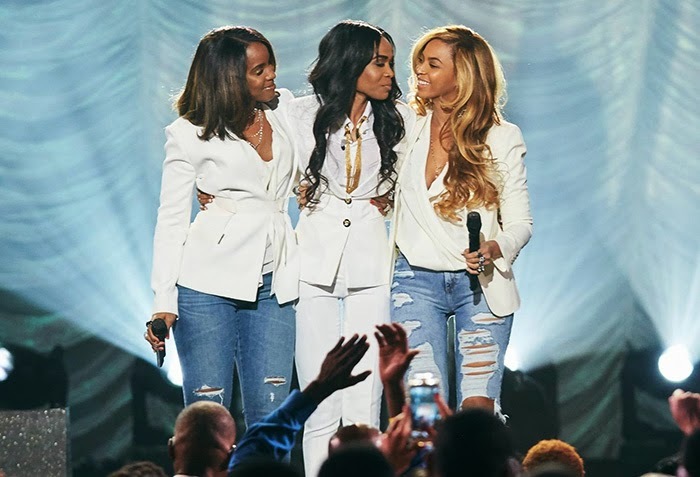 Just weeks ago when the biggest night in Gospel music (the Stellar Awards) was recorded word got out that the Beyonce and Kelly had joined Michelle for her performance. Fans jumped on every single video released, photo, and audio clip of the three singing an old hymn Always Remember Jesus, and Michelle's Say Yes. Tonight the awards show aired and we all got to witness the reunion happen on Gospel Music's biggest night. It was truly beautiful to watch Michelle lead her sisters and the room into worship with a song we all have come to love. I totally love this feel good record, and the whole Journey to Freedom Album. Shout out to Michelle for just being Michelle. I believe she has introduced so many to the love of Christ. See their performance below! Say Yes is on iTunes! DC3YS | SincerelyBeyonce.com from SB on Vimeo.